We finally got the onions and potatoes planted in the Family of 4 Garden yesterday. 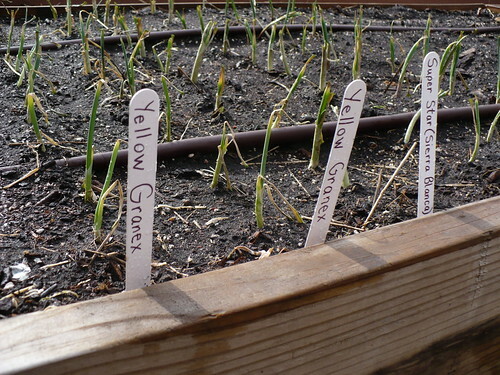 We planted 3 kinds of onions: Yellow Granex, Red Candy Apple, and Super Star White onions. All of the onions planted were transplants, so there’s a little bit of instant gratification in seeing more things growing in the garden right away. The rumor that I’ve heard here is that you plant onion transplants if you want big onions and you plant sets if you want green onions. I’m not sure where that idea came from. I suspect that it may be easier to get large onions from transplants because our spring growing season can be so short. However, I think it is perfectly possible to get full size onions from both transplants and sets.We always planted sets growing up. We planted the onions in rows about 4-5″ apart and the plants were 3-4″ apart within the rows. That means that in a 2 ft x 4 ft area, we have about 72 onions planted.We also put down a little bit of fertilizer, since onions need phosphorus to thrive. Our potatoes are ‘Yukon Gem.’ This is a new variety that isn’t widely available yet, but I managed to find some seed potatoes from an online catalog. ‘Yukon Gem’ is an improved version of Yukon Gold. It supposedly yields higher than Yukon Gold and has better disease resistance. We don’t have any Yukon Gold to compare it to, but we will see if it turns out to be productive. Planting potatoes is one of my earliest gardening memories, and generally a pleasant one. (Much more pleasant than the memory of hoeing potatoes, although that’s not really too terrible either.) 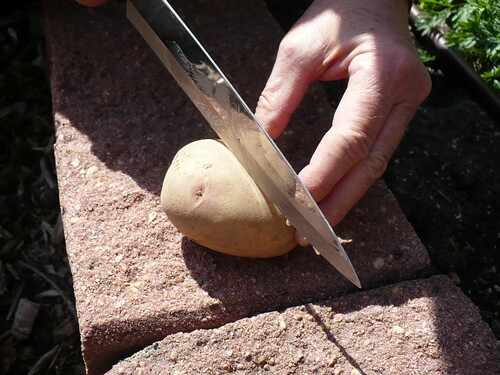 The first step in planting potatoes is cutting your seed potatoes into pieces. If you look closely at the end of the potatoes above, you can see the divot in the end – that’s the eye of the potato. Each seed piece needs to have at least one eye, because that’s what will sprout. 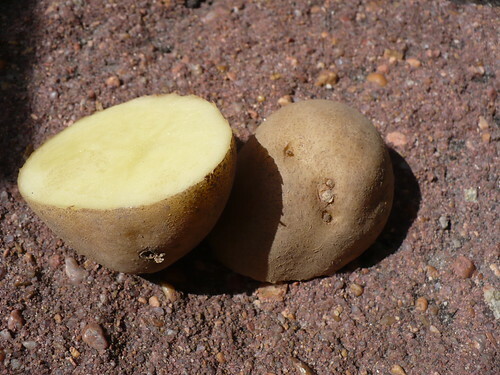 It is also important that there’s a decent sized piece of potato along with the eye, because that will help feed the plant as it begins to grow. Yukon Gold and apparently Yukon Gem too are a little bit wimpy in the potato eye department. Other varieties have lots more eyes. We didn’t cut the pieces up as much as we could have, since we had 2 1/2 pounds of potatoes to plant a 4 x 4 foot area. Some people say that you have to let the seed pieces “heal” awhile before planting to prevent the seed from rotting. I’ve never done it that way and we very rarely had a problem with rotting. Your choice! The seed pieces were planted about 4-6″ deep and 10-12″ apart. The rows were also about 12″ apart. If you do the math, that means we should have about 16 potato plants in the Family of 4 Garden. 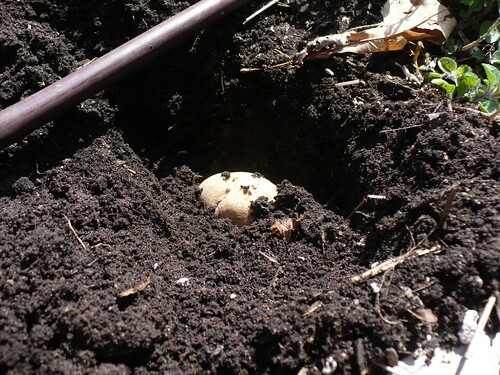 Posted on March 23, 2011, in Family of 4 Garden, Working in the Garden and tagged onions, planting, potatoes, spring garden. Bookmark the permalink. Leave a comment.